Today I visited a famous observatory for Tadami Railway Line near Roadside Station Ozekaido Mishimajuku in Mishima Town. 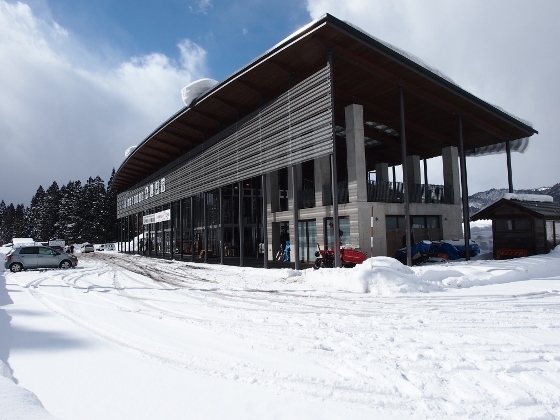 There are really many viewing spots along the Tadami Line and this place is one of them. Above photos show a view of the Roadside Station Ozekaido Mishimajuku from outside and the guideboard for the observatory. Above photo shows the view from the observatory. 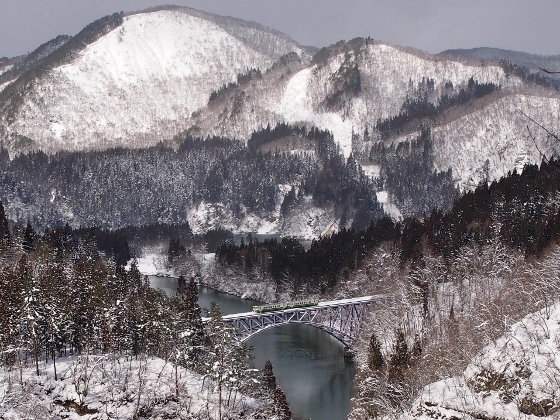 I could see a tiny Tadami Line train passing on the bridge over Tadami River with the background of winter scenery. 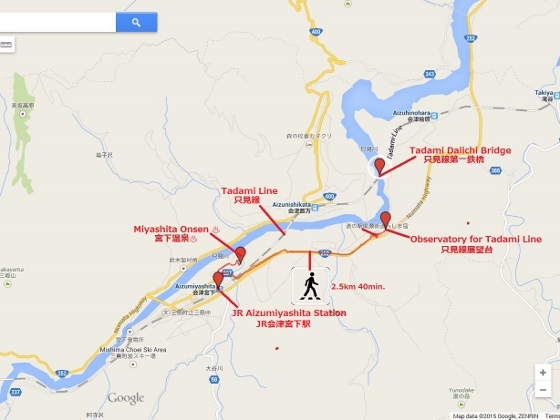 Now, Miyashita Onsen (Eikoukan Inn) in the map is also a very good hot spring in Mishima Town. It is only several minutes' walk from Aizumiyashita Station. 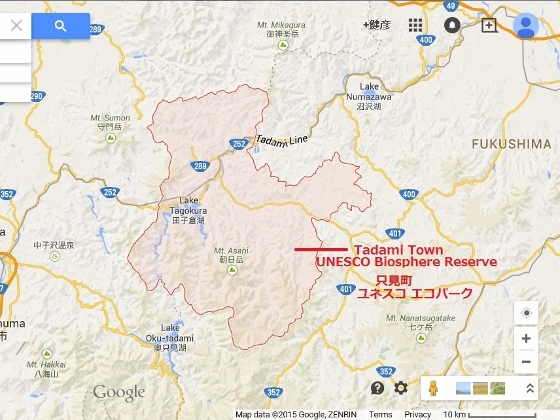 Tadami Town (please see the map below) was designated as UNESCO Biosphere Reserve last June with its invaluable untouched wild nature. A part of the train and backup shuttle bus of JR Tadami Line have been wrapped with the advertisement of it since then. 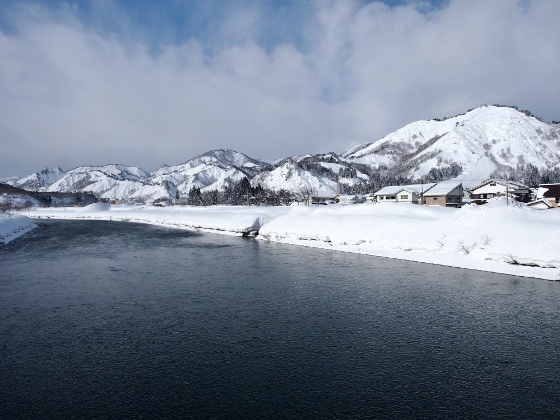 Above photo shows beautiful scenery of Tadami River and surrounding mountains this morning which are included in the UNESCO Biosphere Reserve. 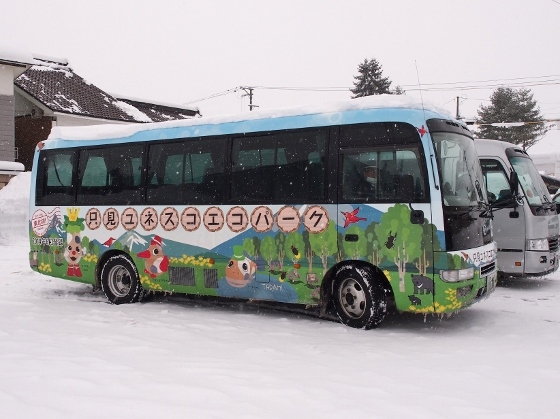 Above photo shows a special ad-wrapped backup shuttle bus parked in front of Tadami Station. 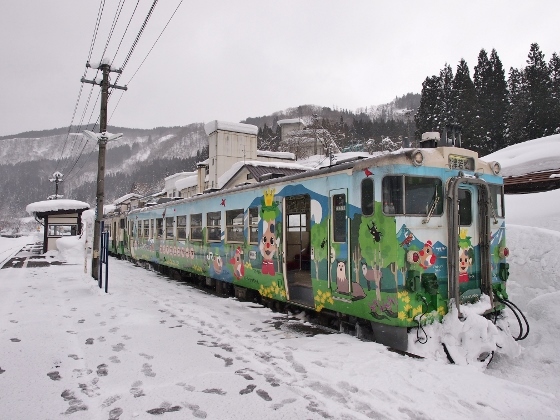 And above photo shows a special ad-wrapped Tadami Line train at JR Aizukawaguchi Station. 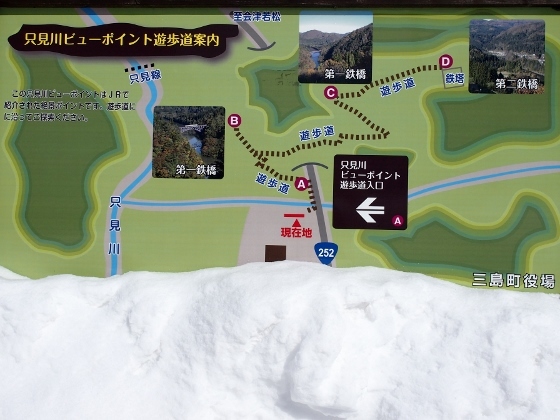 Today I visited intensely snow covered Tadami Town of Fukushima. 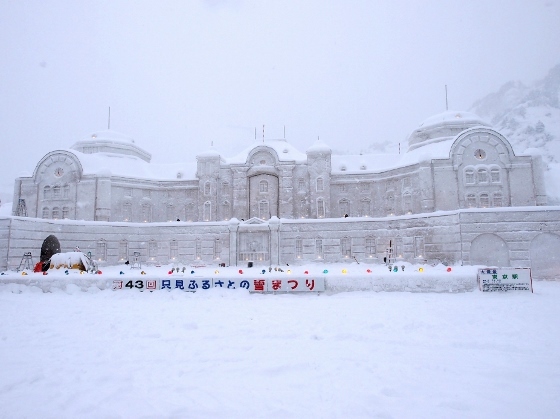 They are making a great snow sculpture of Tokyo Station for this year's snow festival on this weekend. 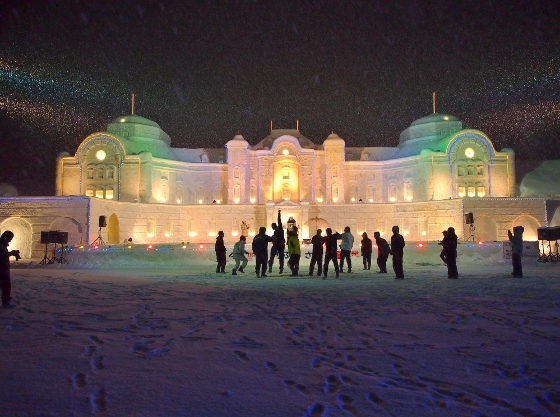 The location is in front of JR Tadami Railway Station shown in the map below. You can take JR Tadami Line from Aizuwakamatsu Station. Here it is in the above pictures still under construction the day before the event. Magnificent! 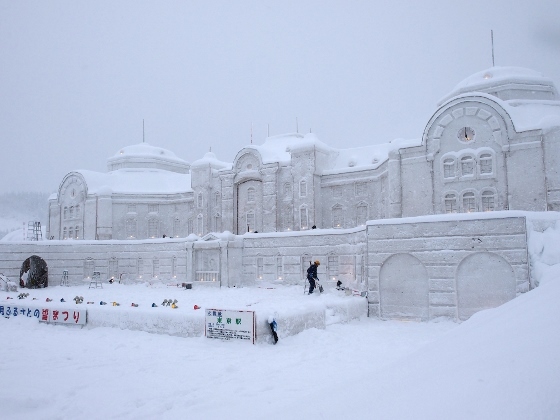 This is the Tokyo Station which had the 100th anniversary last December. You can see how big it is compared to the working man there. 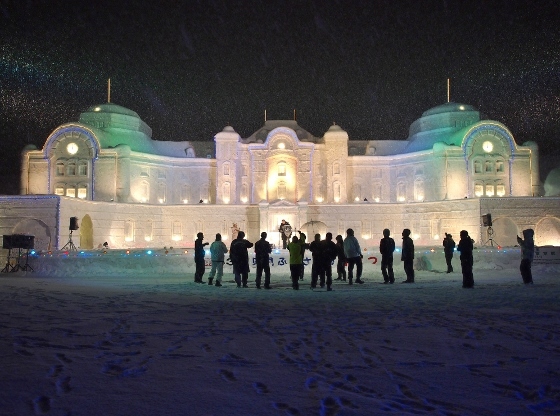 Light up ceremony was held this evening from 7 p.m. as shown above. JR Tadami Line is now divided into two parts. 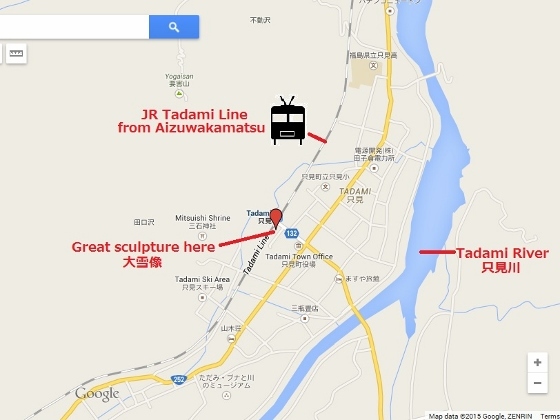 Currently, backup bus service connects the two parts between Aizukawaguchi and Tadami Station. 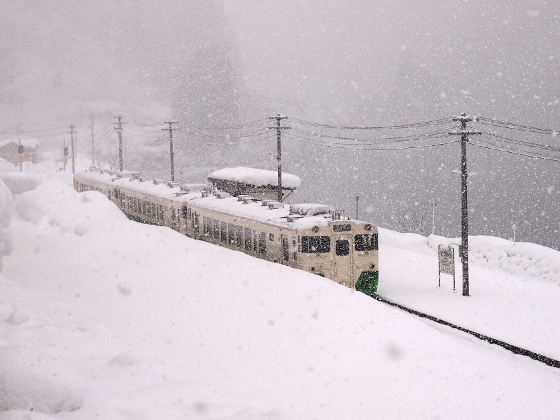 Above photo shows the train in deep snow at Aizukawaguchi Station today.